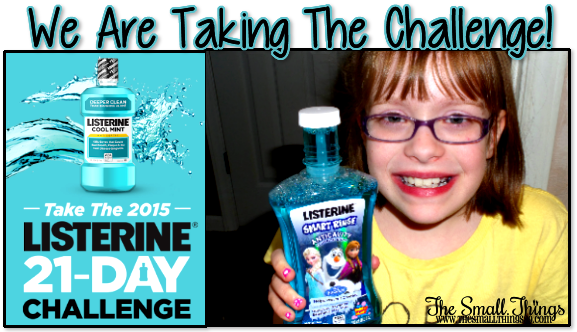 We are taking the #LISTERINE® 21- Day Challenge! Are YOU? HomeWe are taking the #LISTERINE® 21- Day Challenge! Are YOU? LISTERINE®- I am sure you have heard of the brand right? If you haven't you are living under a rock. Recently I discovered the LISTERINE® 21- Day Challenge! Oh My! This is exciting! The challenge is going to give my family a chance to redeem ourselves when it comes to oral care. Have you heard of it? Well, to start off visit the LISTERINE 21-Day Challenge page and pledge to swish with LISTERINE® for 21 days. You will commit to rinsing once in the morning and once at night everyday! After you opt in and commit- you will be able to choose an expert in fitness, nutrition or home organization and receive daily personalized emails with tips, video content and guidance establish good habits in your chosen area! That is not it! Did you know that by signing up up for the challenge and sticking with your rinsing routine you will have a daily opportunity to instantly win exciting prizes! Prizes include: a Fitbit®, a $100 Container Store® Gift Card or an Amazon Fire TV! For an extra added bonus: for every seven consecutive days you swish, you’ll be entered into one of the sweepstakes drawings for a grand prize. I don't know about you, but I think that is pretty awesome! Now speaking of rinsing- I have a hard time with my 8 year old brushing her teeth by herself. I usually have to remind her and I have to stay on her to do it correctly. Let's face it-8 year olds do not really comprehend oral care like us adults do. Her oral care is so important to me. *I* don't have very good teeth to be honest. I was raised in a a household of chaos and having us kids brush our teeth was the last thing on their minds. I do wish it were different! That is why I am so strict on Lydia to keep her teeth in great shape! Her dentist once told me that when your baby teeth get decay, it can affect your adult teeth too! On another hand- Did you know that brushing misses 75% of your mouth? Can you say EW! Thankfully, LISTERINE® has all of the right products for my family to tackle our oral care immediately! Check out what we received! I can't wait to follow up with you in a few weeks to share how our LISTERINE® 21- Day Challenge is going! Did you know that Walgreens can help you in your journey to stick to healthy habits? They offer a wide range of wellness products, including LISTERINE®! Are you planning on taking it? Tell me about it! Be sure to visit them on their social media below to stay up to date with the latest!